A recent survey by Ascend2 found that the number one goal for marketers in 2017 was to increase sales revenue (58%). This was followed by generating more leads (47%) and increasing website traffic (44%). 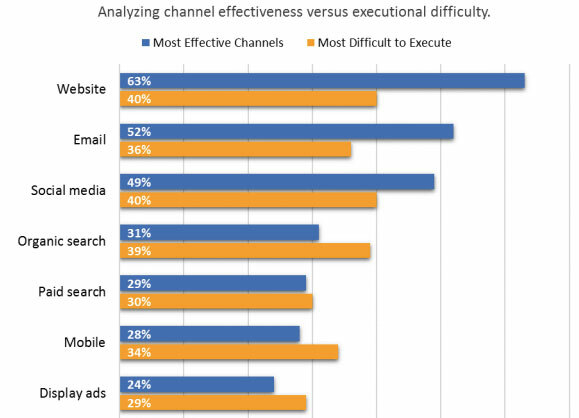 It also found that although a website is the number one most effective marketing channel, it is also the most difficult to execute properly. The reason a website is difficult to execute is that because there isn’t one solution that fixes all potential problems. How do you know what changes need to be made to make your website a 24/7 traffic- and lead-generation channel? The answer starts by putting a process in place to monitor performance, test ideas, and continually implement changes. 42 percent of B2B marketing professionals state that a lack of quality data is their biggest barrier to lead generation. This is a surprising problem in a world where data is easy to come by. Start by ensuring that tools are in place for tracking traffic, acquisitions, conversions, and most importantly (in my opinion), behavior. This information will help you understand where your audience is coming from, how they are behaving on your website, whether they are viewing content elements, and whether they are converting. Not sure where to start? Personally, we follow a simple “zoom out/zoom in” method where we first zoom out to look at the big picture of data to identify a problem. This makes it easy to quickly identify any anomalies in behavior that may require a more focused look. Once an anomaly is found, we “zoom in” to see what changes may be causing it. By comparing the post-anomaly and pre-anomaly periods, we are able to see what content and behavior on the site might be its cause. Keep zooming in until you find the answers you need, then take action. We all love new things. In fact, when we see something new, dopamine is released, which is why we feel good. So we should be excited to continually add and test new elements on a website to find ways to increase engagement and conversions. Another benefit of testing new elements is that when our brains spot something new, the “novelty area” of the brain activates. This area is close to the learning and memory cortexes of the brain and its stimulation can actually increase our ability to learn. This means that adding something new to your website can actually increase your audience’s chances of remembering it. 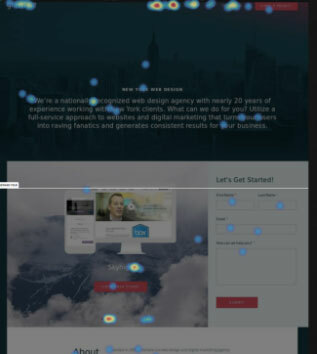 Continuing with our example above, after identifying pages that have seen a decrease in performance, take a closer look at the behavior of the audience on your website, using tools like heatmap tracking or screen capture videos. This will provide you with a peek at how your audience interacts with your content and some helpful hints as to the changes that may be needed to guide your audience down a more focused path. Sometimes the actions that need to be taken are so obvious you might be able to skip testing, but other times testing may be required. If testing is needed, set up an A/B test to identify the top performing page and then publish the winning page for everyone to see. Improvements can be the result of big or small changes. Big changes pose a higher risk that your audience will become frustrated and turn away from your site. Smaller changes are often barely noticeable at first and almost feel “natural” to your audience. You probably haven’t noticed any dramatic changes on Facebook because Facebook is a great example of small changes occurring over time. Subtle changes pop up here and there aimed at increasing the visibility of stories, ads, and other types of content. Take a look at what Facebook looked like in 2015 compared to 2017. At first glance, the changes might not be noticeable. Even though there have been significant changes to the design, they have been executed in a way that isn’t too disruptive so as to avoid user frustration with the platform and possible loss of users. This same methodology can be applied to web design. You need to continue spending time investigating your website’s data to monitor performance, testing elements, and making changes that enhance usability and increase engagement and conversions in order to avoid turning your audience away.